The Yankees seemed destined to head into this season with a very good team with one big flaw: suspect starting pitching. They solved the problem in a matter of minutes one Friday night in January, pulling off two big deals that established them as favorites to win the pennant. The trade of Jesus Montero and Hector Noesi for Michael Pineda and Jose Campos, and the signing of Hiroki Kuroda, changed the Yankees’ biggest question from “Who can we trust after Sabathia?” to “How can we fit all these guys into our rotation?” There’s downside risk on offense as Father Time punches veterans like Alex Rodriguez and Derek Jeter (and Raul Ibanez!) in the face. But the Yankees might have fewer weaknesses than any team in the league, and look like a strong bet to vie for a second World Series title in four years. This isn’t the first year that the Yankees have more or less punted one lineup spot for the sake of (relative) austerity. But signing a near-40-year-old Raul Ibanez to DH stretches the limits of responsible roster building. With Rodriguez, Jeter, Teixeira, and Sabathia owed $75 million in 2014 (the year Hal Steinbrenner wants to cut the payroll below the $189 million luxury tax threshold) and total payroll around $210 million now, there was little chance the Yankees would pursue a top-flight hitter on a multiyear deal. But a shorter-term deal for a bat when Ibanez flops or another creaky veteran runs into injury trouble could make lots of sense, especially with the Yankees’ pitching now shored up. 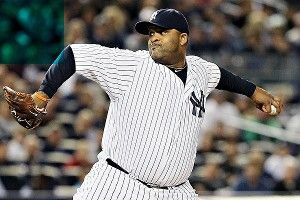 If it’s possible for a pitcher making $23 million a year to be underrated, then CC Sabathia just might be underrated. The aircraft carrier-sized lefty has tossed 230 innings or more in each of the past five seasons, the only pitcher in baseball to do that (Roy Halladay just misses). He’s one of only two pitchers to post an FIP of 3.54 or lower in each of the past five seasons (Halladay is the other). He’s perfectly suited for Yankee Stadium’s short porch in right, holding lefty hitters to a .638 OPS lifetime. But he’s tough on right-handers too, limiting them to a .249 batting average and .310 OBP in 11 seasons. Despite all of that reliable greatness, the Yankees can now afford a Sabathia pullback, given what they’ve done with the rest of the rotation. That 3.14 FIP projection for Pineda looks optimistic, typical for Bill James’s forecasts. But Pineda’s still a 23-year-old beast with one of the best fastball-slider combinations in the game, coming off a big rookie season. Kuroda will likely regress moving from Dodger Stadium and the NL West to Yankee Stadium and the AL East, but he’s always shown good command and remains a good bet for 30 starts of above-average pitching. Even the back of the rotation now looks strong: With A.J. Burnett shipped to Pittsburgh for a bag of beans, the Yankees still have admirable pitching depth, as Phil Hughes could easily sub for Garcia at the five spot. Between that rotation, elite set-up man David Robertson, and the ageless Mariano Rivera, this might be the year the Yankees’ pitching finally surpasses their hitting. the best shape of his life. And hey, there are few to zero other viable possible breakout picks on this team, so why not? The Yankees win the World Series. They can match up with any other AL rotation in the playoffs, their lineup remains deep and talented, even if it’s a bit old (as usual). The back of the bullpen’s stacked, and there are plenty of resources here to make in-season acquisitions, as long as they don’t affect the 2014 austerity plan. The Bombers will be a very tough out this year. and there are a few intriguing sleepers out there, too. Perhaps a more realistic worst-case scenario would have the Yanks sneaking in via wild card, then having to play the always-treacherous one-game playoff to keep their title hopes alive. As loaded as the Yankees are this year, a sudden-death battle against David Price or Jon Lester or Jered Weaver or Yu Darvish wouldn’t be a comfortable assignment.